We've been located in Trenton for 14 Years and in 2012, Dr. Vasudha Basava purchased the practice. "I trained in New York and while I enjoyed my time there, I really wanted to find a town like Trenton to start my own practice. I like the idea of really getting to know our patients and being able to take the time to give great personal service,". While the ownership is new, you'll see the same friendly faces working there you've seen in the past. Whether you come in for a basic cleaning and check-up, or for a more involved procedure, our goal is to make your visit as relaxing and comfortable as possible. Nancy Gross, our receptionist and Dawn Van Ostrand, our dental assistant, have been part of the Trenton community for years. They will take time to listen and answer all your questions. Dr. Basava is experienced in the most advanced medical techniques, ways to make procedures quicker and easier than they were even a few years ago. 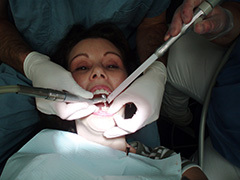 Procedure such as root canals used to be tough but with the right experience and technology, patients are pleasantly surprised at how quick and easy they are now. For patients that are really nervous or anxious, we offer laughing gas (noxious oxide) for most procedures to keep you completely relaxed. Your comfort is our priority! We Create A Care Plan Just For You! Each person and situation is different. What you want and need is unique to you. That's why we take the time to listen to you and understand how we can best serve you. We'll do a careful exam to determine exactly what you need then explain all the treatment options. We'll answer all your questions then come up with a treatment plan tailored specifically to your personal needs. And we'll give you tips and ideas to keep your teeth healthy. At Trenton Family Dental Care, you're not just another procedure, you're a neighbor. "Caring for our patients is my top priority"
Dr. Basava graduated from the New York University College of Dentistry in 2006. She was a top student there, winning an award for "Excellence in Dentistry and Human Values” in recognition for her "special awareness and commitment to the humanitarian considerations in superior health care." That blend of excellent dental skills combined with a personal touch has become her trademark. After graduating from dental school, she practiced in the Dayton area for 6 years before coming to Trenton Family Dental Care. She worked with all ages, from children to the elderly and welcomes the opportunity to serve a range of ages. "I really enjoy helping patients from a wide variety of ages. Each has their own special needs and it's rewarding to see each patient walk out smiling, whether the patient is 4 or 84," said Dr. Basava. When not in the office, Dr. Basava's life revolves around her family. She and her husband Surya have two young daughters. The family loves to travel, especially to warm locations like Florida. For Dr. Basava, dental care is about more than molars and bicuspids. It's about personal relationships. 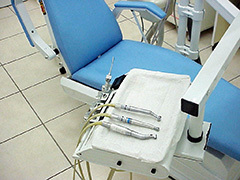 "For me, good dental care begins with a conversation. I listen to each patient; find out why he or she is here and how I can help. The exam comes after that, then if we see a problem, I explain the options and together we decide on a treatment plan that meets specific needs of the patient. I want to give enough information to empower each patient to make a smart decision." "Educating every patient is also part of my calling. I want to help people learn how to prevent problems, that's much better than having to treat problems. When we finish a cleaning and check up and can tell the patient everything looks great, the smile they give is beautiful"
Dr. Vasudha Basava brings advanced dental care with a personal touch to Trenton. Dawn graduated from Edgewood High School and then earned her Dental Assistant Certificate from the Institute of Medical-Dental Technology in Cincinnati in 2004. Friendly and easy-going, Dawn likes to get to know each patient and makes an effort to help everyone feel relaxed and comfortable. “I see each patient as an individual, not as just another chart,” she says. When she's not helping patients, she likes to be outside. She rides a Harley Buell and sees it as a great way to relax. She also enjoys fishing and camping and spends as much time enjoying nature as she can. She has two daughters, Sophia and Autumn. Our receptionist is the first voice you here and the first face you see so it's important to have a friendly, knowledgeable and organized person at the front desk. Nancy Gross, with 14 years’ experience at Trenton Family Dental Care, is the perfect person to help you get started and on your way to a better smile. Nancy is a long time Trenton resident and Trenton High School. She answers the phones, makes appointments and helps with billing and financial arrangement. "Sometimes patients are nervous and not sure what to expect. I try to explain a little about the procedures and help calm them down," she said. "And when they leave, they tell me that it was easier than they thought and smile!" Camping and outdoor activities put a smile on Nancy's face. She and her husband like to take their fifth wheeler to visit campgrounds from Kentucky to Florida. Their favorite winter destination is Largo, Florida near Tampa. They have two grown children and five grandkids. "My job is great! I get to talk with friends and neighbors and help them get great dental care for their family!"